In group&apos;s of 4, we can create diamonds, within a square that has four sides. The immediate two sides of the ball must be supported by teammates to create width. 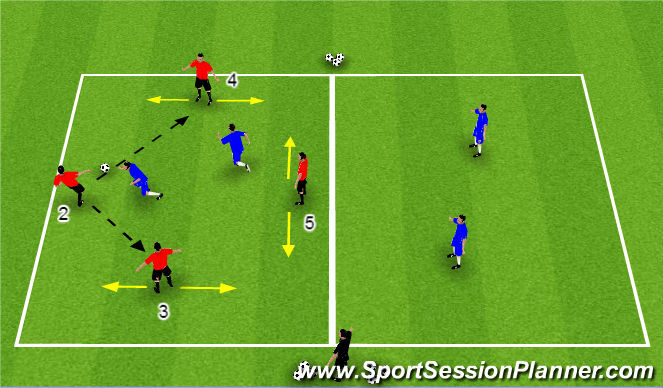 While the player creating length is looking to receive a pass between/behind opponent. The attacking players keep the possession of the ball for as long as they can. Defenders must win possession back and play the ball to their own teammates in the opposite half of the field. This will allow the activity to be more realistic to a game and it will be easier to transfer from the practice field to the game because players must adjust from attack to defend and back to attack. If the ball is kicked out by the defender at any time, then the attacking team receives possession back. Just like a throw in. If the attackers kick it out the defending team in the opposite half receive possession from the coach at centre. The player who loses posession must become the defender in the opposite half. E.g. #3 & #4 provide width for #2, while #5 provides length. The purpose of the supporting players&apos; is to get into a &apos;good position&apos; in order to split the defenders. Players need to pass the ball simply, quickly, accurately and more fluently than in 3vs1 in order to seperate the defending partnership.